Phoenix Mayor Greg Stanton gave a fine State of the City speech this week (you can watch it here). One could quibble with his "Not even a decade after the Great Recession shook us to our knees, Phoenix has emerged stronger and more resilient than ever before with an economy that is breaking free from the chains of the boom-then-bust cycle." Phoenix has far under-performed its peer cities in this recovery. But Stanton is an upbeat guy and Phoenicians have a hard time with reality. He deserves credit for the courage to call out the Kookocracy's war on cities. Now, the hard stuff. Outside the prepared remarks, the mayor supports building a new arena to be shared by the Suns and Coyotes, with at least some taxpayer money involved. The Arizona Republic reported, "Phoenix already has a permanent tourism tax on hotel and motel stays and car rentals. It is in the process of selling the city-owned Sheraton hotel and the Translational Genomics Research Institute building downtown, projects supported by the tourism tax. By getting those buildings off its books, the city could potentially free up revenue to help pay for a new stadium." "Build your own damn sports complex. Who wouldn't agree? In a nation exceptional in its hustles, the professional sports stadium-arena grift is one of the most outrageous. 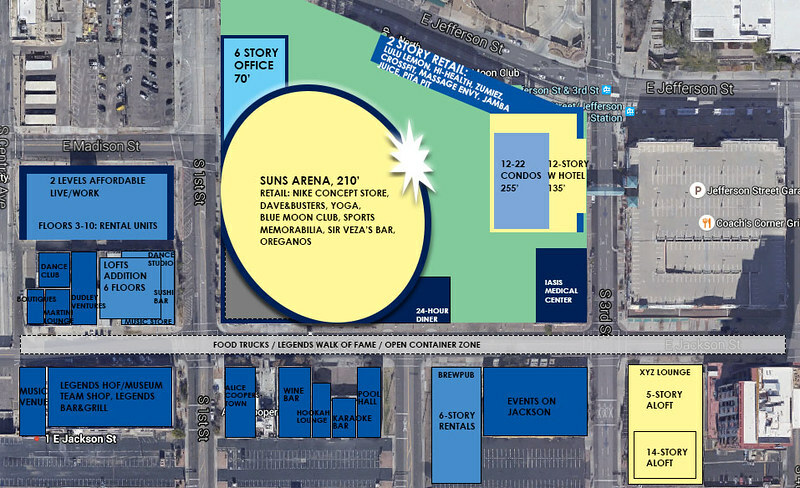 The Suns arena is less than 24 years old and was extensively renovated, with big help from the city, in the mid-2000s. Madison Square Garden was built in 1968, although later renovated while retaining its soul-killing dullness. What is now called Talking Stick Resort Arena is old by NBA standards. We're not talking about building for the ages. Getting cities to fund ever-more-lavish new arenas for wealthy owners is key to the con. Yet they continue to do it. The nearly new Barclay's Center in Brooklyn, which houses the NBA and NHL, required New York to issue $511 million in bonds. A rarity is the coming home in San Francisco for the Golden State Warriors, which will be entirely privately financed. So it can be done (according to Forbes, the value of NBA franchises has tripled over the past four years. The Suns are the 13th most valuable, with $154 million in revenue and valued at $1 billion). Let 'em build their own damned arenas and stadiums. But, Phoenix being Phoenix, it's not this easy a call. I went over some of the issues in the previous column about the Diamondback's demands for their stadium. But they are worth expanding on. While downtown Phoenix has made enormous progress from its comatose state of the 1980s, it has least benefited from the "back to the city" phenomenon that has dramatically transformed San Francisco, Seattle, Portland, Los Angeles, San Diego, Denver, etc. I most recently wrote about what's happening in Seattle here, and you can read more of these success stories on Rogue's City Desk. But these cities have diverse, robust economies commensurate with their size — in some cases, such as Seattle and Denver, they punch well above their weight. And their downtowns are natural centers with a magnetic pull on people, companies, and amenities in this age of center-city revival. Not so in Phoenix. The economy, such as it is, keeps spinning out to the fringes, even within the expansive city limits of Phoenix. Downtown faces a dearth of major corporate headquarters (APS is mid-range at best, and much less of a presence than in decades past, outside of its battle against solar energy; Freeport McMoRan also lacks size and faces a global commodity slump). Phoenicians lack a consciousness about even the name for the metropolitan area, much less one that makes downtown the natural core. So it's not hard to imagine the Suns, Diamondbacks, and Coyotes self-financing their sports complex on the rez near north Scottsdale with the help of tribal coffers. (I remain skeptical that a metro area with such low wages and lack of major companies can support four big-league teams). The consequences for downtown are impossible to predict, but I can't imagine they would be good. Despite the growing importance of ASU, the biomedical campus, convention center, CityScape and light rail (WBIYB) — all helped with investments by Phoenix taxpayers — and despite the smaller-scale victories of the Resistance, pro sports provide a huge boost. Without them, could downtown continue its almost accidental recent rise as the new center of this itinerant metropolis? It's a big risk to take. Stanton is right to line up a plan. Now the question is how much Phoenix must get screwed to avoid a worse fate. It deserves better. But, as Clint Eastwood's character in Unforgiven says, "Deserves got nothin' to do with it." One last note for the Better Call Sals of the world: All of the metro area is subsidized, not least the sprawl zones that made a few winners thanks to freeways. Downtown Phoenix is owed, still, for the decades of civic malpractice that destroyed this once vibrant and authentic heart. I'm not a fan. I have a hard time working up enthusiasm for professional sports' franchises, and I even wonder exactly who or what fans are cheering for. The players? They come and go. The logo/mascot? Meh. How about the only consistent element of any team: the owner/management elite. Year in, year out, they field a product that people buy if it's good and ignore if it's mediocre. It's the typical marriage between an abused woman (the real community) and the overbearing husband (the fake community of pro sports' hustles). Still, since we're talking about Phoenix, what other attractions are there downtown? The semi-comatose patient needs periodic - and expensive - blood transfusions just to keep the few vital signs it has. Reduce the three-legged stool of downtown "vibrancy" to two legs, and you're asking for trouble. On a hot day in summer, you might ask yourself why anyone goes downtown. Take away the ball game, and you may no longer need to ask the question. If downtown dies, the metroplex itself is no longer coherent. The civic sense of direction no longer has a true north. The constituency for civic reform and improvement collapses because it is no longer defined geographically or culturally. Every functional city better have a strong core or it's going have difficulties attracting global capital, creative citizens, along with generating local pride. It will end up blurring the necessary self-explanation that both citizens and outsiders can easily understand. Phoenix, sadly, is a nice place in some respects but it is in no way compelling as a city. I don't envy Stanton for having to truckle before super-rich corporate pirates who have no loyalty to the community. Ken Kendrick is the perfect Republican, someone with the soul of an accountant and an air of wealthy entitlement. Richard Sarver's wealth comes from real-estate investment, so at least he's understandable in terms of the local economy. For better or worse, it's the mayor of Phoenix who has to stand for the little bit of civic soul that the region has. Scottsdale and Tempe, both better cities qua cities, don't want this headache. You can't fake a good city, least of all people who live there primarily for its warm temperatures and ease of driving/parking. The tragedy is that Phoenix has had local stewards in the past who gave the city an actual foundation in civic infrastructure but weren't able to grow that legacy as the city exploded in size. Phoenix looks and feels like a dinosaur with a pea-sized brain disappeared inside a sprawling body. You want somebody, really anybody, to tackle this problem with a transformative project of some kind. But Phoenix is very nearly hopeless in that arena. Somebody is busy playing golf in Scottsdale. "Downtown lacks any major corporate headquarters (APS is mid-range at best, and much less of a presence than in decades past, outside of its battle against solar energy)." Thats just what I think we don't need, mining companies. Our Arizona Senators rammed thru a deal to destroy more in the Top of the World area (Oak Flats) and the Koch (coke) boys are trying to mine the Grand Canyon. Should governments subsidize sports stadiums with the hope that it improves or revitalizes an area? Should governments ever subsidize sports stadiums?. Is the fact that a government subsidizes one thing a compelling argument for it to subsidize MORE things? screwball urban revitalization project you could come up with and it wouldn't matter. Again, you' re going to get small victories at the margins. But you can't top market supply/demand. Someone IS busy (and happy) playing golf in Scottsdale. Inphx, Scottsdale was cool until they paved the road. And what is it with the illegal grass where idiots in motorized roman carts while drinking booze supplied by women in very brief clothing, chase little White Balls. Why not Black balls? Despite many views expressed here, there are tons of folks who think Scottsdale is just swell the way it is. Amazingly, there are some people who live there and LIKE it!!! And, stunningly, they don't want to live in a $500 psf 1800 sf condo with an electric car and they don't care that they have to get in a car to go to the grocery store. It just boggles the mind, doesn't it?? I feel terrible that I have forced myself to live in 320 square feet, drive a Honda Fit and think golf is goofy. I pine for that half acre 3000 square foot monster I had on South Mountain? Not for a nano second. I repeat Scottsdale (and Phoenix ) used to be ok villages. Too bad T.R. didn't make the Southwest all Wilderness. And why is there going to be a Frys market not a Whole Foods in Downtown Phoenix ? Better yet a Ranch Market. That way nobody from Troon will buy their veggies there. My friend and i stopped for refried beans and a flour tortilla at Ranch Market two nights ago. Best Beans in town. Stanton is fighting a losing battle. One the legislators are going to crush him. Two PHOENIX is broke with regard to needy infrastructure. The grass is growing out if the cracks in the asphalt. Vacant buildings and weeds abound. Water resources, garbage disposal and recycling are on the edge of collapsing. And on and on. (PS, see my first post ). Uh, Scottsdale as it is wouldn't exist without Phoenix. This is not a symbiotic relationship. It is a parasitic one. The article seems to be about two points: (1) the state of the city and (2) need/financing of arenas. “Item one”: Knowing very little about the “state of city”, I’ll pass (mostly). Reading the transcript – most of it seemed to be of the “field of dreams” variety. Only time will tell. Given the audience and content, it was more of a pep-talk/sales pitch. Since it was given by a sitting governmental official (either from the right, left or center) everything needs to be taken with a great deal of skepticism. Most won’t out-and-out lie (but some will). But mostly what you are going to get is half-truths, evasions, idyllic or end-of-the world forecasts, etc. “Item two”: arenas. I think every town, small city, medium sized city, large city and mega city needs an area; for mega-cities probably two or three. The size and opulence depends on the size of the city. For a town, it might be a large room in city hall. It’s an amenity; and a required one. But it must be understood that they exist for the citizens, not sport-team owners. Given that a basketball team will rent the building for 40 or so nights – a very good rental-fee can be worked out - maybe down to close to zero. What you (the sport team) won’t get is naming rights to the building, managing the building for non-basketball events, dictating how many seats there are versus how many luxury boxes, etc. We’ll talk about parking and concession revenue. The sports team does have (at least) good point though. All public facilities, particularly arenas, are in need for continual refurbishment and improvement. Most economic analysis fail to include this. Amazing the public need for Roman Gladiators and blood letting. I just heard that pretty soon there'll be a wonderful new retirement opportunity for seniors on the go, a twenty story tower right on Mill Avenue in downtown Tempe, for the discerning, sophisticated urban retiree who wishes to live on the campus of one of America's most popular Sun Belt party schools. If you hurry, and bring lots of money, you can still get in on the ground floor. And there'll be a Starbucks there! And a bookstore! Sorry, off topic, but I couldn't resist. Pat, that's the tower directly in the Sky Harbor airport landing path? And did i read some place that the FFA is reconsidering the flight patterns? And the legislators want to close Sky Harbor and move it to Casa Grande? Funny thing is, it's probably not an entirely bad concept, as an urban alternative to Sun City self-sorting, but living in a giant phallic symbol at Suntan & Beer Bong University might not be a draw for as many wealthy alumni as they hope. A palace for sugar daddies willing to provide financial hardship loans to struggling young college students. Bernie is right about free eucation and how bankers stole the eucation system. Vice News has a good piece on "How Banks Stole Education". Cal, is your messiah wrong about anything? Soleri, I amazed that U would think I have a Messiah other than a Sahuaro. Generally speaking I post here to inflame the conversation. And love it when you and your adversary's get it on. Sure Bernie the human is wrong as is Hillary that appears to almost be a human Robotic walking and talking Wallstreet Sri. Bernies bigger mistake was Leaving Vermont with the insane notion that the Bankers would let him live. Him and his young Joan De Arc's that are are revolting with computer passwords rather than swords. You are the Savant here aided by the power of DUNE sandworm excrement. But possibly you should step back and re-examinee the hologram ghoul you are about to put in charge of the planet. PS, HILLARY just got The Koch (coal) brothers vote? Cal, I love your poetic sensibility but it's less an idea than a refuge. Politics is one of the least poetic endeavors there is. There may be thunderous righteousness and rapturous applause, but if there is, it's simply another way of hoodwinking the rubes. This my way of saying that politics and religion should not mix. It's not good for either one. I don't think politics is evil so much as a reflection of our imperfect willingness to engage others in the grubby realm of reality. When it becomes an effort to seek transcendence or meaning, it's religion. Two new posts on the Questions for Nominee Sanders column. Check out noted developmental shill Grady Gammage on Arizona Horizon telling how Phoenix is a sustainable city. The usual claptrap from Grady but interesting. Thanks for the info. I have always considered GG to be a shill for the developers and scammers of the REIT bunch.We "old time Phoenicians" who don't like what Phoenix has become can thank those who brought us the CAP for what Phoenix has become.Without the water we would still be in the 60's. I have always maintained that we are screwing ourselves of a place to stand. What could be done here is what should have been done with CityScape. Hire some of the best designers in the world to conduct a public urban design planning process for the site. Create a Steering Committee with executives from the Suns, Coyotes, the City, DPI, ULI, neighborhood leaders, and potential partner institutions like ASU to oversee the process and provide a recommendation to the Mayor and Council. Concepts should include infrastructure, like public plazas, trees, bike facilities sidewalks, maybe localized sustainable energy and water, and other community benefits such as affordable housing and a major public recreation center. Show how high rise residential, office, retail, educational/institutional, entertainment and hotel space could be co-located on the site to contribute to the financing of the arena and associated public infrastructure. Make it a 24/7, 365 destination, not just a sports venue. Yes, this would cost about $1M or more, but it would be an investment and money well spent. The Suns should pick up part of the tab. Those of you still talking about downtown like it's 2007 really ought to visit Phoenix and absorb the changes that have occurred and will continue to occur with or without the Diamondbacks and/or Suns. Over 1,000 residential units are under construction which will add the critical mass that has always been elusive. Even without permanent residents, the Roosevelt Row area has seen an incredible amount of investment into adaptive reuse projects that have added 24/7 vibrancy. Monroe and Adams are quickly becoming the central hub of downtown proper with several new bars and restaurants, as well as new retail at 111 Monroe and the US Bank building. The Renaissance is redesigning its entire facade and adding more storefronts next year. These changes have nothing to do with the sports teams. Everything about each venue is designed for quick and easy access and exit, and their patrons have added little to the economic vitality of the immediate area. They did their job, which was to reintroduce downtown into the general public's mind as a safe, central, urbanized area, but the 1,000+ residents moving in soon are proof that nobody needs convincing anymore. May U stub your toe on a Sahuaro. PS. do u also go by Henry? James makes good points. As always, Ex Phx Planner brings great insights. Thanks! P.s. James, I spend almost all my Phoenix time downtown or Midtown. Vibrant downtown Phoenix. Compared to Topeka maybe. What about the 26% of Phoenicians in severe poverty with no hope of livable wages. Glad you are happy with the downtown while greater Phoenix burns. I said nothing about Phoenix's job market/economy. I don't even live there anymore; just giving credit where due, since it's been a long time coming (downtown having a 'there' there). Ex Phx Planner - I have similar thoughts. The arena is more important, though not vital, to maintaining downtown as a central entertainment and cultural hub than Chase Field, which is used infrequently and has done little to stimulate the surrounding retail sector because of its insular policies for food, drink, etc. The public space would ideally be a "Legends Square" with a 'walk of fame' leading to a Museum/HOF for AZ sports and entertainment legends (given that the area was dubbed 'legends entertainment district'). Jackson from 4th St - Central could become an open container zone similar to Kansas City's Power and Lights district on game days and weekends. I don't have time to respond right much now as I'm busy chasing Jim Harrison's ghost around Harshaw AZ as it escape from the WAGON Wheel Saloon in Patagonia. @ Drifter re: “What about the 26% of Phoenicians in severe poverty with no hope of livable wages. Glad you are happy with the downtown while greater Phoenix burns.” Twenty-six would be about average. Some cities higher (e.g. Los Angeles) some lower (e.g. Seattle). Recently read a depressing book “Our Kids” by Robert Putnam, which focuses on the plight of the lower quartile of the U.S Population (SES measure); very grim. And Dropping like a rock. Charles Murray wrote a similar book, “Coming Apart” a few years ago. While Putnam looks from a somewhat left-of-center viewpoint a Murray a very right-of-center, both agree that situation is drastic. Neither offers a realistic method of dealing with the situation. Nothing good can come of this. The difference being that in Los Angeles and other cities there are major corporate employers that provide some hope of the economically disadvantaged to climb out of poverty. In Phoenix, those employment opportunities do not exist, and given how the crazy Arizona Republicans' govern, won't be coming anytime soon. Employment opportunities for the underclass in Maricopa are on Uncle Joe's jail work detail. The only major city worse off for extreme poverty is Fresno per the Wall Street Journal. Maybe you should visit Phoenix sometime WKG to properly comment on the armpit of the American Southwest. Drifter said, "Armpit of the Southwest". Drifter I awoke this AM on a rancho near Mexico thinking about all of the above. My mind formulating it into a large paragraph of somewhat thoughtful info. Then I saw your above quote. A four word description perfectly summing up every thing I was going to try and say. Maybe later, I'm off to Ruby AZ to try and solve a few old murder cases.